FRISCO, TX / ACCESSWIRE / December 18, 2017 / With the arrival of the holiday season comes many things: time with family, colder weather, lots of cheer, and, of course, indulgent treats. It is easy to get swept up in the season and let your health get placed on the back burner. Who wouldn't want to partake in all the holiday flavors and foods during this time of year? Customers are raving on the internet, sharing their reviews of the newly released flavor. In her review, Mary Hulet Kemph wrote, "Holiday comfort that is actually healthy! Enjoy the taste of a treat without the guilt." 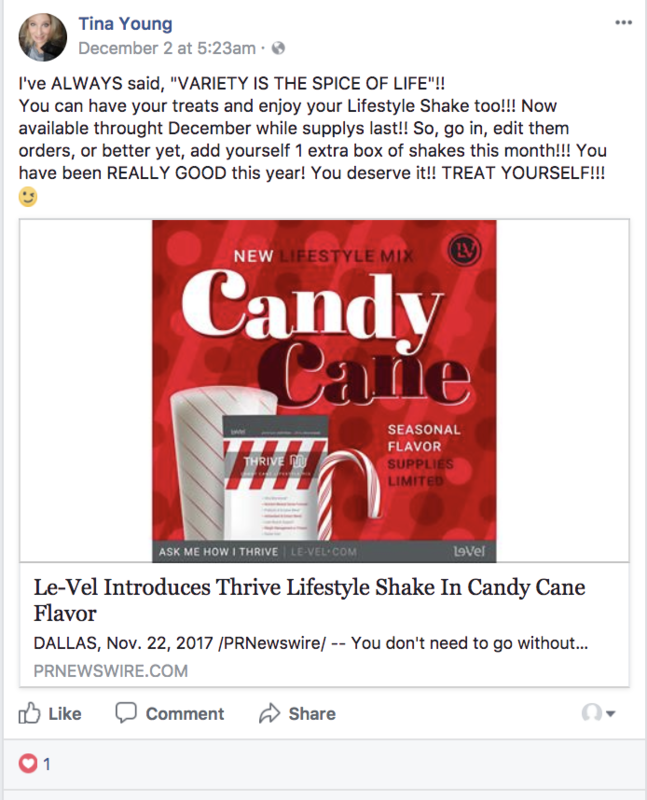 "We all enjoy those holiday comfort foods, but not when they derail our goals for the New Year," say Le-Vel Co-CEOs Jason Camper and Paul Gravette. "At Le-Vel, we've invested significant resources into the development of products that not only taste incredible but also contain the premium-grade ingredients, superior formulas and delivery systems that help you live a happier, healthier life. 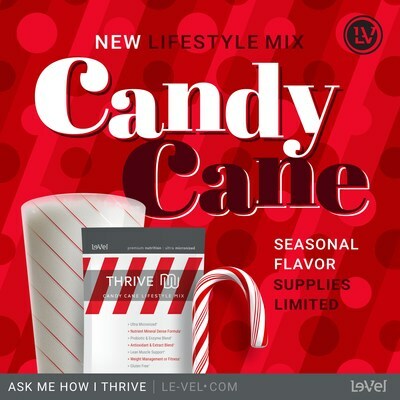 Thrive Mix in Candy Cane flavor can help curb your cravings. It's incredibly satisfying and, combined with the other two steps of the Thrive Experience, provides a strong nutritional foundation for whatever the day has in store for you." Some customers cannot get enough of the seasonal flavored lifestyle mix. 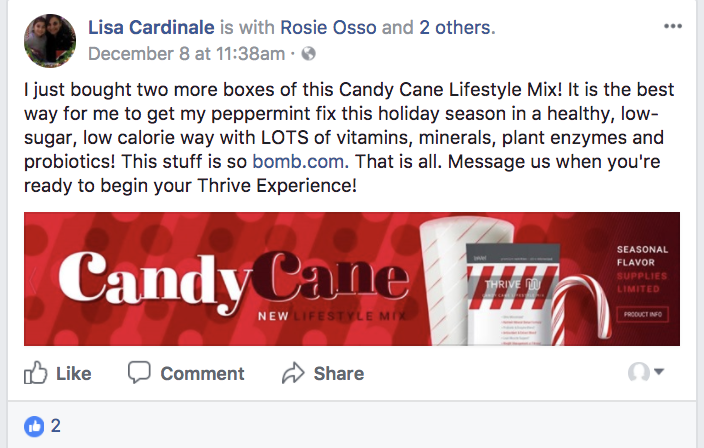 In her review, Lisa Cardinale wrote, "I just bought two more boxes of this Candy Cane Lifestyle Mix! It is the best way for me to get my peppermint fix this holiday season in a healthy, low-sugar, low-calorie way with LOTS of vitamins, minerals, plant enzymes, and probiotics!" Having enough energy to get through the holidays is something everyone could use some help with. Between running around and buying presents for everyone on your list to traveling to visit friends and family, it is easy to lose stamina. Thrivers have long turned to the Thrive Experience, which "provides a strong nutritional foundation for whatever the days have in store for you." The candy cane flavor is just an added and timely bonus for Shake lovers. The "ultra-premium, gluten-free shake" consists of "a proprietary blend of vitamins, antioxidants, minerals, plant extracts, probiotics, and amino acids." Its benefits are year-round, but the candy cane flavor is seasonal. Thriver Tina Young is well aware of this fact, writing in her review of the product, "I've ALWAYS said, 'VARIETY IS THE SPICE OF LIFE'!! 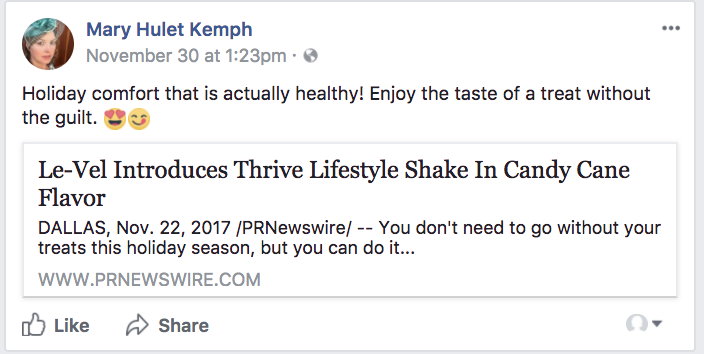 You can have your treats and enjoy your Lifestyle Shake too!!! Now available through December while supplies last!! So, go in, edit them orders, or better yet, add yourself 1 extra box of shakes this month!!! You have been REALLY GOOD this year! You deserve it!! TREAT YOURSELF!!!" Le-Vel THRIVE was founded in 2012 by Jason Camper and Paul Gravette. Le-Vel THRIVE is a direct sales, multi-level marketing business in the health and wellness industry. The company is the only health and wellness company using a completely virtual cloud-based technology for its operations. Camper and Gravette founded Le-Vel THRIVE in hopes of providing nutrition, supplements, and a supportive community of independent brand promoters and Thrivers to allow individuals using the products to not only survive their day to day but to THRIVE. Le-Vel is a billion-dollar company and has over 7 million brand promoters and customers. The company is dedicated to raising money for multiple charities and has contributed to NBCF, Toys for Tots, the Hoyt Foundation, Americares, and more.